Design psychology is a powerful tool to wield, motivating users to behave in ways that can be in their interest, or our own. Our presenters will discuss contemporary trends in design psychology theory, but will provide plenty of real-world examples. We have found creative and evolved examples of companies using design psychology to benefit or manipulate users. As experienced professionals, each with an interest in different facets of design psychology, we will choose a white hat or black hat – some taking the side of good and honest intentions, with others taking the dark side where manipulation and coercion reign. On which side will you fall? 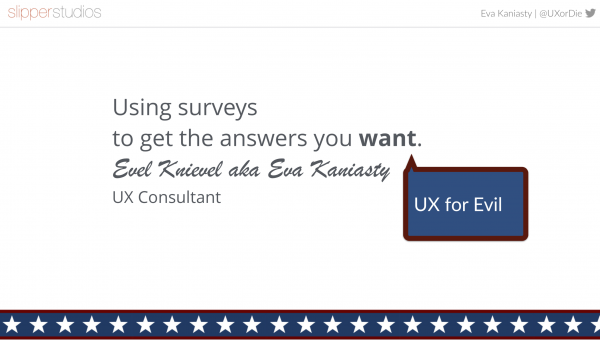 Surveys can be invaluable in convincing skeptics of the validity of research findings, so they are a worthy addition to the UX design toolkit. Mark Twain famously quipped, that “there are three kinds of lies: lies, damned lies, and statistics.” In this presentation, you will learn how to use this truism to your advantage. By following a few simple rules for designing survey questions, you can get respondents to tell you exactly what you want to hear. If, on the other hand, you happen to be a principled researcher, you can turn the rules around and design surveys that provide valid, actionable data. The choice is yours.